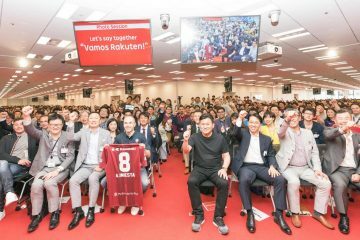 The entrance to Rakuten Crimson House in Tokyo was abuzz on Saturday, September 8, as a crowd of blue and gold-clad basketball fans gathered outside the office exterior for their chance to meet with a bona fide NBA superstar. 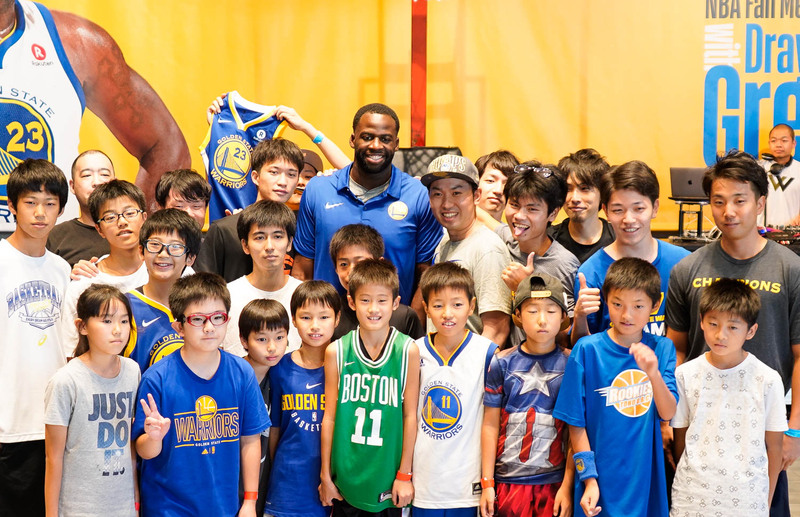 The excited fans were there to see none other than three-time NBA champion, three-time NBA All-Star and former NBA Defensive Player of the Year Draymond Green of the Golden State Warriors. 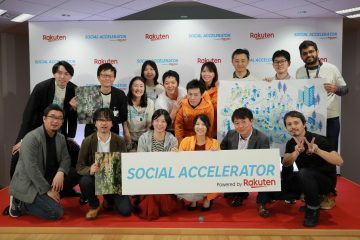 Green’s visit to Rakuten headquarters was part of a tour facilitated by the NBA and Rakuten TV, who recently joined forces to broadcast NBA games in Japan. 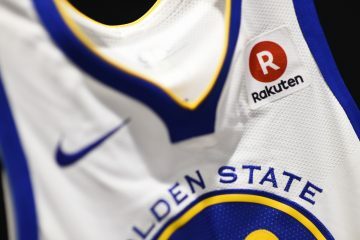 Green’s team, the Golden State Warriors, also partnered with Rakuten last year in one of the NBA’s first jersey sponsorship deals. 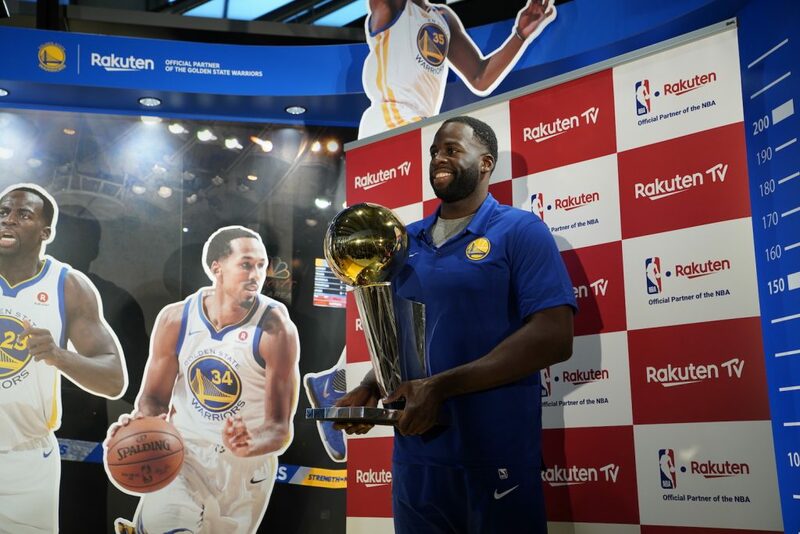 Draymond Green poses for media with the 2018 NBA Championship Trophy. 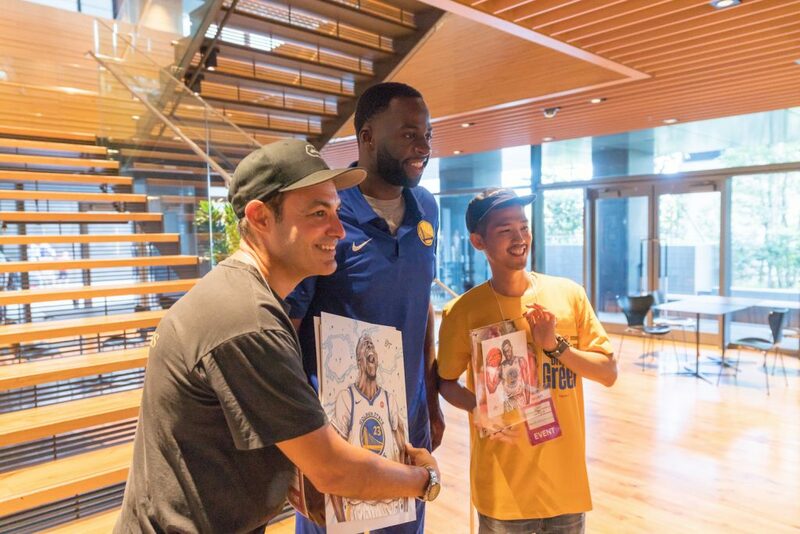 World Renowned caricature artists Dai Tamura (right) presenting Draymond Green with his portrait. 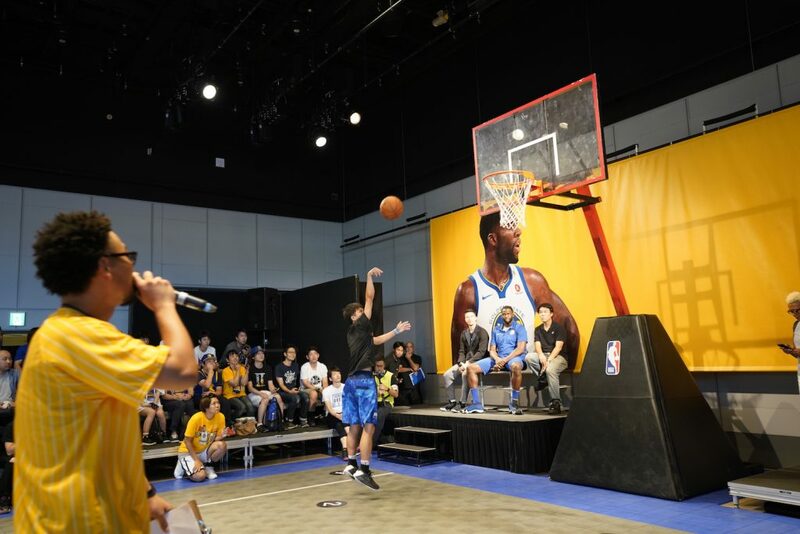 Fans tried their hands at the NBA 2K19 video game and the NBA League Pass virtual reality experience while waiting for the main event of the day, when fans were invited to participate in the “Draymond Green Shooting Challenge.” Scores of challengers competed against the clock to sink a number of baskets from five select spots around the court, with the quickest shooters earning the chance to challenge Green himself. 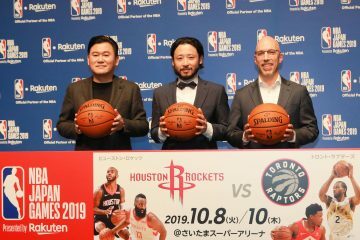 The event was hosted by MC Mamushi and Chris Sasaki, two well-known personalities from the Japanese basketball scene, who were later joined by Maya Miyagawa of the Rakuten NBA32, Rakuten’s NBA ambassador program in Japan. 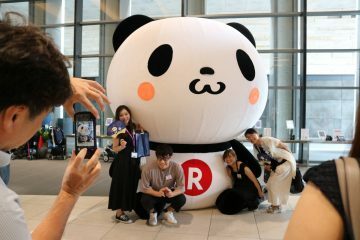 Fans eager to catch a glimpse of their on-court idol spilled out of the entrance of the venue in a display of basketball fever that made the NBA star and his team feel right at home. 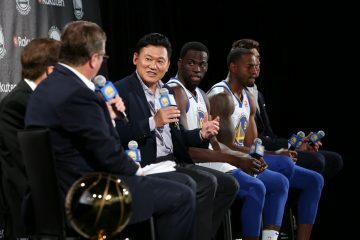 Draymond Green looked on as the finalists displayed their basketball prowess. 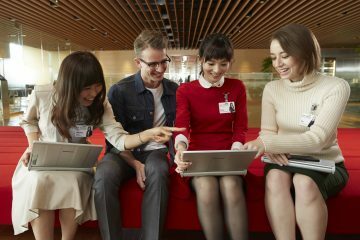 The event heated up as the four finalists took turns racing against the clock to determine their challenge time for Green to beat. 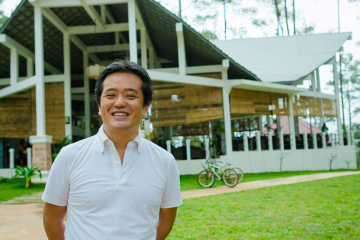 The reigning champion cheered the contestants on from the stage, until it was the star’s turn in the spotlight. 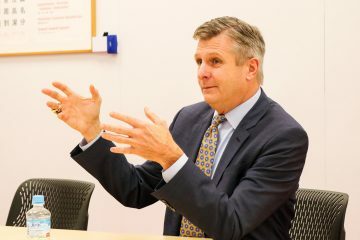 After some playful banter, Green made quick work of his opponents, ending his challenge with a dunk and eliciting a roar from the enthusiastic audience. 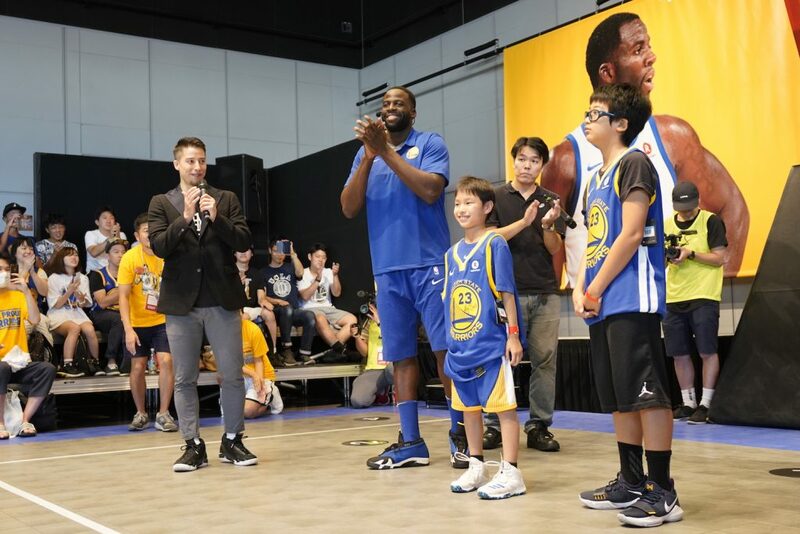 Draymond Green congratulating finalists Ryo and Yua. 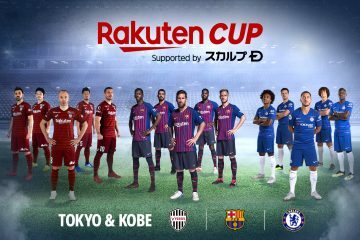 The event ended with a Q&A session for fans, who wanted to know all about Green’s training routine and mental preparation for games. 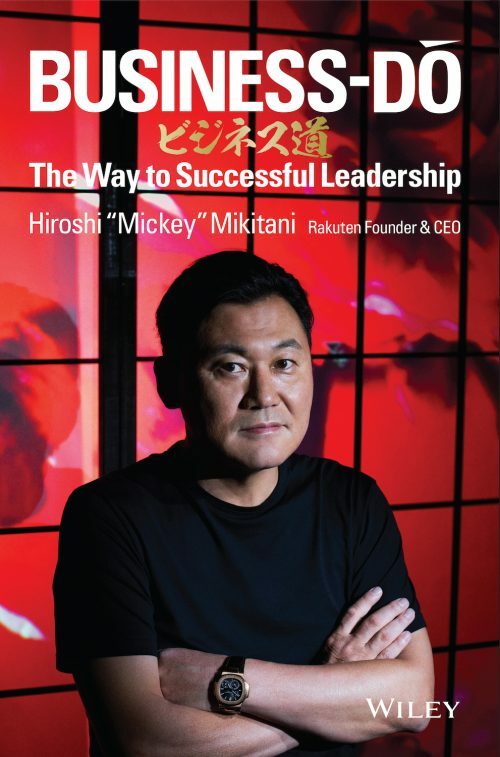 When asked about his favorite Japanese food, Green appeared to settle on sushi, before remembering another crowd-pleasing favorite: A5 grade wagyu beef.